Hey! I’m Trickssi, an Ohio-based artist looking to spread my wings through my work in cosplay, dance, and advocacy for the purpose of effecting change in our community. Wanna know why I decided this platform was for me? Let me tell you about my journey and why I’ll be so grateful for your support! If you'd like a condensed version, you can skip to the TL;DR right above the BENEFITS section. Art doesn’t exist in a vacuum, particularly the art of cosplay. Every person who chooses their cosplay has a reason for doing so, and when I began creating cosplay more seriously in 2014, I knew what I wanted to share with the world. My first character was Presa from Tales of Xillia, pictured below in the first photograph set I had taken at Otakon while wearing her. She’s a side character and antagonist in the video game but has a background that only the ancillary materials described. A former spy, Presa used her body to gain intelligence and was later betrayed and graphically tortured. The game only shows her after she has escaped and has been working with the main antagonist for a few years. 2014 was the year I was sexually assaulted. I experienced a great deal of denial and avoided getting help for nearly a year. The physical act of crafting Presa from scratch gave me something positive to focus on, something that I could do to feel safe in my thoughts. At the time, I didn’t equate Presa’s experience with what I went through. When I began my journey of recovery, I realized that she had been a healing figure for me. She went through personal hell and emerged not only alive, but emboldened to join a cause. Her act of wearing revealing clothing was the radical action of taking her body back; that idea inspired my work and my desire to share that message. When I cosplay, I’m taking my body back. I’m also taking back the bodies of the characters themselves and telling their untold stories. The saying, “if you want to understand someone, walk a mile in their shoes” has never been clearer to me than when I craft a costume or wig, put on the makeup, and walk (or hobble—hey, some of those shoes aren’t the most comfortable!) onto the con floor for hours. People who know the character often react. Perhaps the character was their favorite, or perhaps their least favorite, or perhaps they’ve never seen someone cosplay it in person before. This personal connection allows me to speak both for myself and my character. If my character is less liked, less understood, and more criticized for existing or acting the way they do in their narrative, I strive to find a meaningful connection. I study their movements, their words, their poses. Through wearing their clothing, I organically discover how comfortable or uncomfortable the outfit is and how the character might be restricted by it. I think about what went into the design and why it was important for this character; whether it was a practical choice or a visual cue for its audience. Each character teaches me about their world. Of course, like any other kid raised on dance and theater, I simply like dressing up and wearing makeup, and not being myself for a while. As anyone who cosplays can tell you, getting all those details right takes time, effort, and funding. Even with bought costumes, I like to modify them to fit my body and pay special attention to the styling of the wig, makeup, and poses I apply. Cosplay is a hobby that I would do regardless of support from others, but I’m grateful for everyone who does support me. Without cosplay, I wouldn’t have made as many strides in my recovery nor would I have understood the value of the perspective and control different outfits give me. My goal is to represent every kind of character—from the silly to the beloved to the scantily-clad antagonists—with grace and intent. I take my position in the community with responsibility, knowing that everyone who sees my cosplay has their own story, struggles, and viewpoint as the art's beholder. I can’t change everyone’s negative or narrow-minded views of a character, but I can present the character in a way that honors them, which might start conversations on how real people (other cosplayers) are viewed and treated. I’m always conscious of the effect cosplay has on the community and world at large and I want my legacy to reflect that. For more information on why I cosplay the characters that I do, follow the links here and here for personal essays about Presa and Velvet Crowe. Why the heck is dance in here, too? For those of you who don't know, I’ve been in leotards and tights since the age of 3. Dance is in my blood. I love doing it, I love watching it, and I love talking about it. You can take the girl out of the studio, but you can’t take the studio out of the girl, and other trite idioms, et cetera. Around the same time I started cosplaying, I started realizing I didn’t like the way dance was fitting into my life. I was unhappy teaching in a studio environment that discouraged innovation and furthering of my dance education. I was just as unhappy when I attended formal events at some anime conventions that weren’t designed with dancers in mind. For example, there were several DJs who lacked knowledge of what music could accommodate the needs of all their listeners including dancers, not just the “prom” crowd. 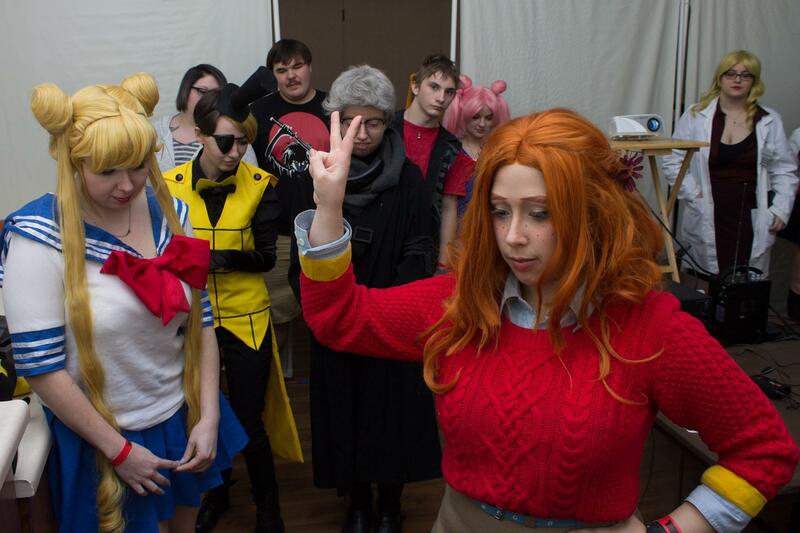 Rather than accommodate the lowest denomination of dance ability or confidence, anime conventions need to hold themselves to a standard higher than “prom.” Why? Because partner dances like ballroom and dancesport are a cultural component of contemporary Japanese culture as well as American culture. Moreover, accompanying lessons should teach elements of etiquette and consent that tend to be lacking in our convention culture. Not everyone has access to dance and life education outside of these lessons. Not everyone has a partner or the confidence to practice dance outside of a learning environment. With this in mind and armed with many years of experience teaching beginners, I want to change the “formal ball/dance/event” community within the anime convention community to be a safer, more enjoyable, and more educational space. I want to teach lessons that accommodate every kind of dancer regardless of age, ability, experience, orientation/identity, partner acquisition, and any other factor that might hinder someone from enjoying dance elsewhere. Using Fanimecon’s Black and White Ball as a model, I want to encourage events to coordinate styles of dance to music that can be enjoyed by everyone (ranging from anime to gaming to Japanese pop music and beyond). But, not unlike the song from Broadway’s Chicago, I can’t do it alone! I need more hands on deck to allow me to craft appropriate playlists, print educational handouts (both on etiquette/consent and what they learn in my lessons), travel to the location of events, coordinate decoration and screen display, help teach lessons, and spread the message of the joy of social dancing. This field is highly specialized; I actively edit and compile songs while applying knowledge of BPM and movement sensitivity. It takes time and great effort. I'd like to encourage qualified volunteers across the country to work together to improve events so that regardless of who hosts the event, it has a viable, ongoing, and inclusive legacy. If you’re able to contribute to the cause of getting everyone moving, you’re helping my vision of a healthier, happier community! If you’ve made it to this section, you’ve already seen how my advocacy, in particular for survivors of sexual assault, abuse, and harassment, informs everything I strive to do for my community. As a woman in the cosplay community, not only have I been harassed in costume, but I’ve heard many stories from fellow cosplayers who have had harassment and worse happen to them while they were at a con. Whether the stories were typed in public spaces or whispered to me over bathroom sinks, I understood that harassment occurs everywhere at anime conventions to the point where it's unfortunately expected. I can only speak for my personal demographic, but any type of cosplayer can be harassed, just as any type of person can be the offending harasser. I remembered the disapproving stares and catcalls when I wore skin-revealing outfits of favorite characters, and hurting, not just because I was treated as an object, but because the enjoyment I got out of the character connection was soured by the memory. Conflicts of harassment in this community are often painted as “drama" and dismissed or unexamined in an appropriate context. It got me thinking: why does this happen? Why so often? Why do I never get through a single convention without experiencing or hearing about stories like that? I began to envision a for-us, by-us network of support for cosplayers that provides a nonjudgmental atmosphere and resources for recovery after negative events. In November of 2016, I put a shovel in the ground for the Cosplayer Survivor Support Network, but it needs more volunteers and help with its framework and functionality. That’s part of why I need you! I want to educate convention attendees that “Cosplay Is Not Consent” is NOT enough. Signs like this remind guests not to harass, but don’t elaborate on what they can do to avoid harassing someone. At best, they’re a legal cover for the convention should something serious occur. At worst, they assume every non-consensual act of interacting with a cosplayer will be taken care of by staff. Want to know a dirty, obvious secret? Most conventions don’t have adequate harassment policies that ensure safety and support for victims. And when brought up, this issue is often met with a dismissal or an offer to take it up with the police, neither of which is an effective or trustworthy option. Most staff members aren't trained to deal with the sensitive nature of sexual assault in particular. Worst of all, sometimes staff members themselves are the offenders, leaving the survivor nowhere to turn. Saying “don’t harass” is like saying “don’t murder.” There will still be murders every day, all over the planet. The only way to stop harassment is education about the nature of enthusiastic consent, whether it be regarding taking a cosplayer’s picture or putting an arm around them, or beyond. The only way to heal harassment and help survivors of harassment, abuse, and assault is to provide support to them after the incident. To say, “I believe you,” and listen freely; to give them someone to trust as they work out what happened to them. At Tekko 2017, I had the incredible opportunity to present two panels that incorporated the online anti-harassment organization Uplift. These were panels where everyone in the room could feel respected and safe despite uncomfortable topics. The experience encouraged me to believe that there will be more organizations like this contracted to make conventions safer and enforcing anti-harassment policies. Here’s my dream: I want every anime/gaming/Japanese culture convention to become a role model in anti-harassment procedures through appropriate signage, consequences for offenders, support for survivors, and availability of judgment-free communication spaces in the community. I want never to hear whispered stories about “weird” violations of respect at conventions. I want to see survivors and allies demanding better standards for the conventions they attend so everyone has the opportunity to have an enjoyable experience. Most work to advocate for the rights of survivors is based in volunteership, but the knowledge is extremely specialized and emotionally taxing. Not only do I not get paid to speak up, but I share the most painful and intimate details in order to tell my story and let others know they’re not alone. Nobody can fortify my mind to be able to tell those stories, but your contribution allows me to choose where and how I speak and enables me to reach a broader audience. I want to see how far we can go together to encourage our community to speak up for those who can’t and help survivors on their paths to recovery and self-improvement. If you’d like to discover more about the mission and goals of the CSSN, or you’d like to read some articles that shine light onto difficult topics relating to cosplay, click here or here. TL;DR: Supporting me supports my efforts toward creating respect for the characters I cosplay; implementing dance events that are safe, enjoyable, and educational; and building a support network for survivors of sexual assault, abuse, harassment, and beyond who have unique needs as cosplayers at anime/gaming/cultural conventions. At higher tiers, you’ll be able to view playlists for upcoming formal balls as well as potentially submit your own request for a song. You can even contribute toward individualized dance lessons or a collaboration of our very own to bring into the world of dance or activism in the anime convention scene! Please check out the tiers on the sidebar for further benefits when you contribute to my Patreon. If you don’t see something that suits your needs, you can contribute other amounts than what’s listed there! If you’d like to contribute in other ways, please check out my website. Any outstanding questions you have can be messaged to me here or emailed to [email protected]. Thank you so much for your time and contribution! I can't wait to share my art with you. The opportunity to hold me closer! Receive early access to individual costume write-up descriptions, which includes details about patterns, materials, and tutorials I used to create them. It only takes two! All rewards from the lower tier, plus an opportunity to work with me on dedicating a song at an upcoming formal ball that I am DJing. You've been practicing your East Coast Swing! All rewards from the lower tiers, plus early access to my formal ball playlists and outlines for CSSN-sponsored panels, one week before the convention. Wanna practice with the big kids? Join the troupe! All rewards from the lower tiers plus access to my exclusive, private Instagram account for in-progress photos, stories, and updates. Like the tango, I'm gonna have to earn this one! All rewards from the lower tiers, plus a limited-edition personalized postcard featuring one of my cosplays. A new postcard will be issued quarterly to all patrons who have sponsored me during that three-month period. You want to master American and International?! All rewards from the lower tiers, plus a "follow forever" and a closet cosplay challenge every month! It's a challenging perk that'll really put my creativity (and my wardrobe) to the test. What's better is that each time I do it, I'm going to aim to donate whatever I don't regularly wear from that closet cosplay! Want to take your dancing to the next level? All rewards from the lower tiers, plus the opportunity to schedule a 30-minute dance lesson for an individual or couple via Skype. Lessons are every two months to all patrons who have sponsored me during that two-month period. If you're not interested in a dance lesson, you can choose to enjoy a basic wig commission instead (e.g., cutting a wig or adding an ahoge). We'll be dancing and you'll be the star! All rewards from the lower tiers, plus an opportunity to schedule an hour-long dance lesson for an individual or couple at any con where I'm teaching a dance workshop/lessons. If you're not interested in a dance lesson, you can enjoy an alternate collaboration of your choosing: a basic wig commission (e.g., cutting a wig or adding an ahoge), writing or editing your panel description, or something else within my skill set. When I reach 50 patrons OR $300/month, I'll create a new cosplay with a full writeup + images available to all tiers every three months regardless of convention schedule.